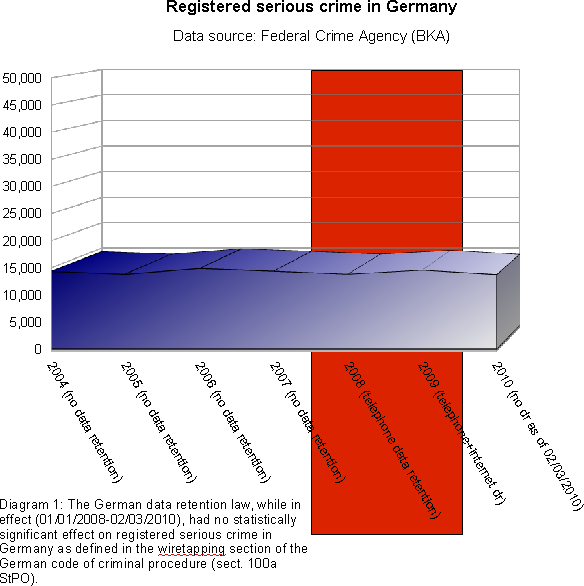 The national crime statistics recently published by Germany's Federal Crime Agency reveal that after the policy of blanket telecommunications data retention was discontinued in Germany due to a Constitutional Court ruling on 3 March, 2010, registered crime continued to decline (2007: 6,284,661; 2008: 6,114,128; 2009: 6,054,330; 2010: 5,933,278) and the crime clearance rate was the highest ever recorded (56,0%). Indiscriminate and blanket telecommunications data retention had no statistically relevant effect on crime or crime clearance trends. These findings confirm the position of more than 100 organisations in Europe that are opposing the EU policy of mass retention of telecommunications data, calling it unnecessary and disproportionate. 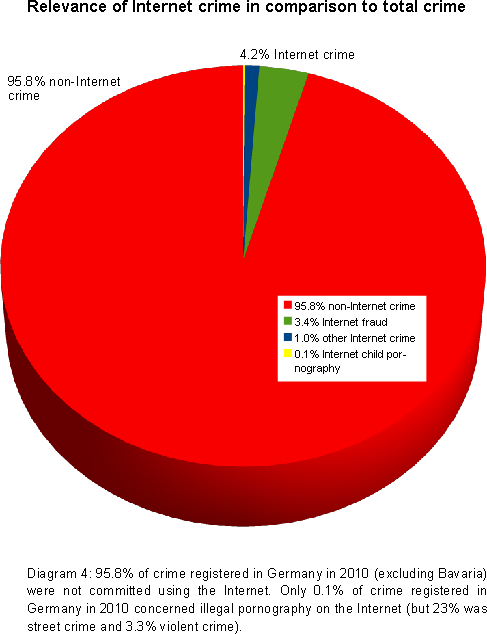 The statistics refute the myth spread by certain politicians and police representatives that the Internet is a "a lawless space" in the absence of mass retention of telecommunications data of non-suspects. 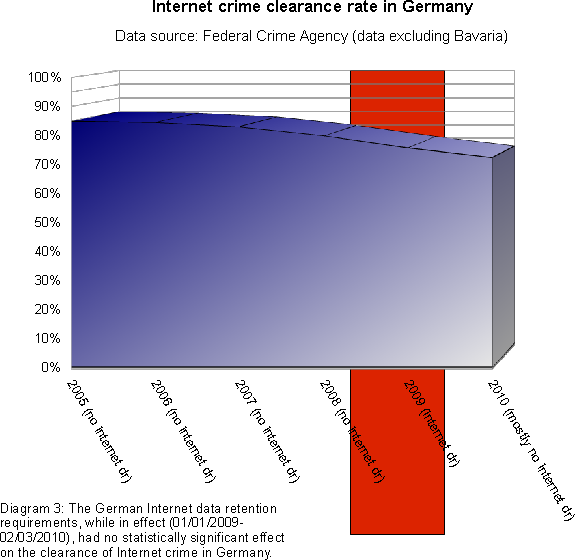 Even without such a policy of blanket data retention, the German police achieved a clearance rate of nearly three out of four Internet offences (71%) in 2010, exceeding by far the average clearance rate for crimes committed without any use of the Internet (55%). 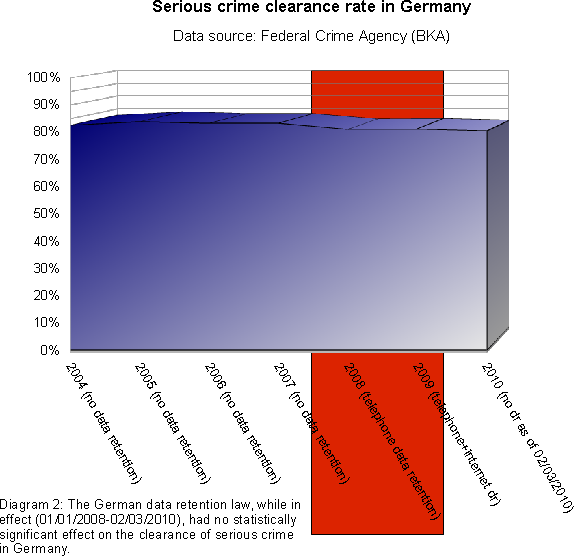 Regarding other European countries, the Scientific Services of the German Parliament have recently analysed "the practical effects of data retention on crime clearance rates in EU Member States" and have come to the following conclusion: "In most States crime clearance rates have not changed significantly between 2005 and 2010. Only in Latvia did the crime clearance rate rise significantly in 2007. However, this is related to a new Criminal Procedure Law and is not reported to be connected to the transposition of the EU Data Retention Directive." "Since crime clearance trends are completely unaffected by the retention of communications data of non-suspects, there is no justification for the EU's "big brother" policy of collecting telecommunications data on all 500 million EU citizens", explains Florian Altherr, member of the German Working Group on Data Retention. "Ninety-eight percent of citizens are never suspected of any wrongdoing. The right of protection of their personal data from unjustified suspicion, data abuse and data loss due to data retention policies must prevail. The EU must respect its Charter of Fundamental Rights and give up its failed experiment of total data retention immediately." "In light of these new crime statistics, the irresponsible campaign of fear and continued scaremongering by some politicians after the annulment of the German data retention law finds no justification in reality", says Michael Ebeling of the German Working Group on Data Retention. "The truth is that with targeted investigations of suspects we live just as safely as we would with a policy of indiscriminate retention of all communications data. The endless exaggeration and emotionally charged descriptions of isolated cases combined with a massive media campaign is both misleading and unethical. In my view this is nothing less than a populist defence of the most privacy invasive and unpopular surveillance measure ever adopted by the EU." In a letter sent to the EU Commission in 2010, more than 100 organisations from 23 European countries have called the blanket communications data retention policy adopted by the EU in 2006 "unacceptable" and have called for its annulment, replaced by a policy of data retention on crime suspects alone. Among the critics are civil liberties, data protection and human rights associations as well as crisis line and emergency call operators, professional associations of journalists, jurists and doctors, trade unions, consumer organisations and industry associations. Blanket and indiscriminate telecommunications data retention is criticised for disrupting confidential communications in areas that legitimately require non-traceability (e.g. contacts with psychotherapists, physicians, lawyers, workers' councils, marriage counsellors, drug abuse counsellors, helplines), thus endangering the physical and mental health of people in need of assistance as well as that of those around them. The inability of journalists to electronically receive information through untraceable channels compromises the freedom of the press, which damages the preconditions for an open and democratic society. Retained communications data has repeatedly been abused and lost, resulting in the unauthorised disclosure of confidential information on private and business contacts, movements and activities. Communications data has also proven to be particularly susceptible to fostering unjustified suspicion, thus subjecting innocent citizens to criminal investigations. The EU Commission is currently preparing a proposal to revise the EU Data Retention Directive, but is so far unwilling to scrap the unpopular policy.